Throttle pedal pad measures 2" x 5". Billet Pedals & Pads For a Truly Custom Look! Lokar '55-57 Chevy billet aluminum throttle pedal is designed to convert original rod linkage to modern throttle cable system. Designed to mount in the original firewall location (click here to see) with offset bezel washers to align the throttle cable through firewall. The gas pad is spring-loaded like the OEM design for versatility in mounting to the right or left of the mounting bracket. Lokar's exclusive upper arm is a one-piece design. Shaft and arm are one piece, requiring no pins. 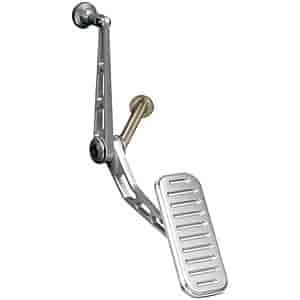 Lokar '55-57 Chevy pedal pads are designed with Lokar's exclusive mounting design, there is no drilling required to mount the pads, which allows for easy installation. Does Lokar BAG-6073 fit your vehicle?